We have recently learned that the 85 year-old wooden Schooner Nina has gone missing at sea, after leaving New Zealand for Australia May 29. We are deeply concerned for all aboard. The photo above shows Nina in Whangarei’s Town Basin earlier this year. We have shared many anchorages with this lovely ship over the last 30 years, she was won her fair share of ocean races, and we are hoping against hope that she will turn up unscathed. Apparently Nina’s crew were mired in the same frontal system that FPB 64-7 Buffalo Nickel used their speed to divert course and outrun on their way to Fiji. On June 3, they called weather guru Bob McDavitt to ask for advice on tactics. Bob advised them to head south and brace for a storm with high winds and big seas. He received a last text the following day, requesting an update for advice. That was the last communication anyone has received. Winds were upwards of 65 knots with 8m/26ft waves. Aerial search efforts have thus far proved fruitless. According to newspaper reports, skipper/owner David Dyche and his family are experienced seamen, and in the midst of a several year circumnavigation. 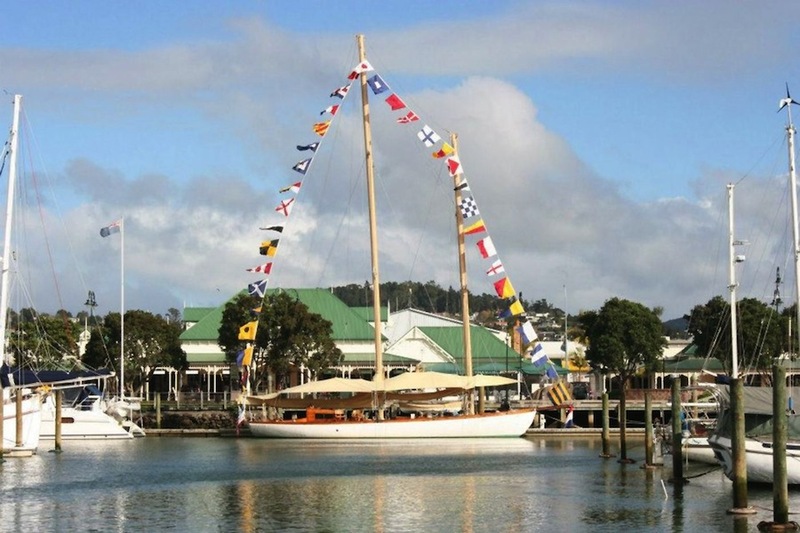 We had the pleasure of admiring Nina dockside when we were down in Whangarei in January. All our thoughts are with the ship’s crew and loved ones. To read about the situation on the New York Times site: click here. To read about it on Yahoo news: click here. Official release from Maritime New Zealand here. This entry was posted on Friday, June 28th, 2013 at 5:46 pm and is filed under Dashew Logs, four. Both comments and pings are currently closed. Not sure if you have heard, but there has been a new development yesterday where an SMS has been “found’ in Iridum’s network that was was never delivered. It said about them losing their sails and making 310 deg @ 4 knots – People believe they may make landfall in Australia in the next few days although looks like nobody has spotted them or had contact with them since it broke off a month ago. the link above goes to a login page. any word yet on the crew. Oops. Thanks for the heads up. Try this one: http://www.maritimenz.govt.nz/news/media-releases-2013/20130704b.asp Apparently there was a further communique from the crew 24 hours after the previously thought last call, stating that their storm sails were destroyed and they were sailing bare poled, but further searches have yet to turn up any results. We’ll have another post shortly.